Why Wait for a Community Shredding Event? In an effort to promote sustainability and green neighborhoods, cities, townships, and counties around the nation are instating a community shredding event—one day of the year or season reserved for dropping off documents in your household to be shredded. Within the last month, Hunterdon County, Wellington Township, Spencer County, and several others have invested in community shredding days. Community shredding days are an extremely effective way to build city morale while securely shredding confidential documents. Not to mention—it’s an excellent way to be green towards our environment! Read more about Hunterdon County’s community shredding day on nj.com! If your community doesn’t already have shredding days, think about the possibility of starting one! 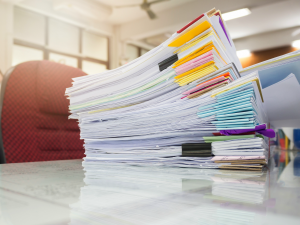 By partnering with a local shredder, you can create an alternative for destroying confidential documents around your community. If you don’t have the ability or means of starting community shredding days, consider using shredding drop-off services instead. Drop off shredding is an excellent alternative to households or businesses with small amounts of paper to shred. Shredding facilities around the nation offer the ability to drop off your small amounts of paper to be shredded. The advantage to drop off shredding, instead of using an at-home shredder, is the time saved. Instead of having to manually shred each document, you can simply drop these documents off and know they were shredded securely. Ready To Find a Drop Off Shredding Location Near You? If you’re finding your home or office is getting too cluttered, consider using our drop off shredding location finder to find the closest drop off shredder near you! Not sure if you have enough paper for mobile or offsite shredding? Just give us a call at (800) 747-3365 or fill out the form to the right and we will help you out!